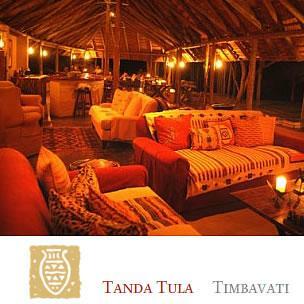 Tanda Tula Safari Camp is an intensely private affair. One of the most luxurious tented safari camps in Southern Africa, Tanda Tula has only twelve tents, and personal attention is simply a matter of course. Offering every comfort, the thatched en-suite tents are imbued with the romance of Africa. Wide wooden decks and spacious bathrooms with Victorian baths and outside showers are reminiscent of a bygone era. Guest areas include a traditional boma for dining under the African stars; a thatched lounge with an open-sided bar overlooking a waterhole; a swimming pool; and a curio shop. The cuisine is superb – fine international flavours with an African dimension - and a wine list to match. 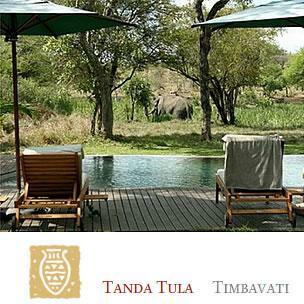 Meals are served under thatch or beneath shady trees, beside the pool, or in the boma under the African night sky. The Timbavati Private Nature Reserve shares an unfenced border with the Kruger National Park - a vast wilderness of more than ten million acres – allowing animals free range and ensuring guests the greatest diversity of game that Africa has to offer. Treading lightly, encounters are guided from years of experience; on the very same narrow paths trodden by cloven hoofs and padded paws, or with the wind whispering softly through your hair as you drive ever so slowly by. A team of expert Rangers and Trackers lead morning and evening game drives on open-sided vehicles. Guests can enjoy the solitude and feel the true expanse of wilderness, as vehicles are limited to one per square kilometer. For those who prefer a more active approach, rangers and trackers will lead walking safaris. These are popular with bird lovers who can delight in spotting many of the 360 species that make this area their home. 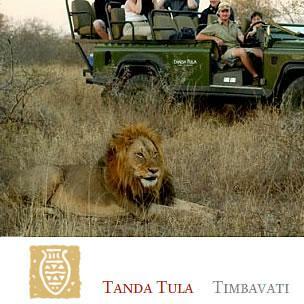 With your holiday, safari or business trip from in to Tanda Tula in Kruger National Park.